Congratulations to the winner, Tom Andino! Over the past several weeks, I have been collecting various items to be given away by the Neighborhood Archive throughout the summer -- books, DVDs, autographs, etc. Entering to win each giveaway will be very simple and instructions will be provided as each giveaway begins. 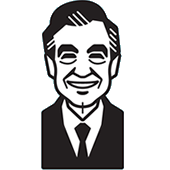 Today, in honor of King Friday's birthday ("The day of the week is Friday, the day of the month thirteen..."), I will be giving away a signed copy of Tim Madigan's book, I'm Proud of You: My Friendship with Fred Rogers. Stop by the Neighborhood Archive Facebook page. Find the post titled "Summer Giveaway #1". Leave a comment under the post bestowing your birthday greetings upon King Friday. At 9pm (CST) tonight, I will count the number of comments (multiple comments by the same person will be disregarded), enter that number into the random number generator on random.org, and the person who left the comment corresponding with the resulting number will be the winner. I will check to be sure the winner has completed all of the required steps (liking the page, the post, and commenting). If not, I will move on to another random winner. The winner will be contacted for mailing address and the prize will be shipped withing a few days.